It’s hard to imagine a world where traffic jams and long commutes are desirable things — that is, unless you’re talking about commercial fleet wraps. These mobile advertising mechanisms let you rule the road with your logo, company name, website, phone number and more right there, grabbing attention. Car wraps for businesses are especially attractive if you’re pushing for broader brand awareness, recognition and reach. These days, who isn’t? 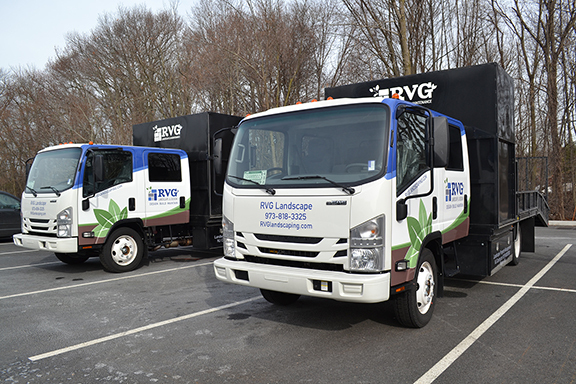 What exactly are fleet vehicle wraps, and are they right for your business? Let’s explore how these visual advertisements can put some pep in your vehicles’ steps and curate more impactful branding. Fleet wraps are a premium way to take advertising on the road — literally. They are large vinyl graphics and decals installed on the exterior of your business’ trucks, delivery vans or service cars. When finished, they bring cohesive company branding to your complete squadron of vehicles, keeping them unmistakable in public. Fleet wraps can take up a portion or cover the entirety of a vehicle. They’re specifically fabricated for cars, so you don’t have sloppy, messy or unprofessional-appearing logos slapped on a side door, color schemes that clash or fonts misaligned with your brand. In fact, the best fleet wraps go beyond merely labeling a car with your information. They relay your company’s values and give a sense of its personality, capturing real consumer attention along the way. The Outdoor Advertising Association of America (OAAA) found that fleet wraps lend the lowest cost-per-impression of any advertising type. Impression costs are so low, in fact, some estimates mark them at $0.04 per thousand views. Fleet wraps can average a staggering 30,000 to 70,000 views per day, depending on vehicle location. The average commute is now 26 minutes one way — and worse in many cities. The average driver travels around 37 miles a day. Over 90 percent of media positioned toward vehicle drivers gets noticed. Two-thirds of consumers say brand familiarity is a significant factor in deciding what goods to buy or services to use. Translation? Installing fleet wraps on your business vehicles is a proven and cost-effective strategy to convert passive eyes into paying customers. Plus, as vehicle technology evolves, businesses using fleet wraps to advertise are poised to reap even further benefits. Though it may still seem like something out of a sci-fi movie, self-driving cars and emerging vehicle artificial intelligencemeans those consumers “driving” around will be less and less focused on the actual driving — and more available to see, take in and remember surrounding information. It’s a dream scenario for your brand. Wrapping improves the appearance of used or older vehicles. Wrapping makes your company appear more professional, credible and memorable. Wrapping unifies the appearance of your public-facing transportation. Commercially wrapped fleets are unmistakable, as unique as your business. Vinyl wrapping is considerably easier to update and manage — much more so than making paint or airbrushed-based alterations to your vehicles. ARE FLEET WRAPS EASY TO PUT ON? Fleet wraps are a combination of high-resolution images and text printed as a large vinyl graphic. This vinyl is intended explicitly for installation on a vehicle’s surface, with a final protective laminate coat and a finish of your choice. At their core, fleet wraps convey what your business is about at a glance. This doesn’t mean they’re forgotten as quickly as they’re seen, though. Make sure every impression counts with designs that match your company’s personality and advertising objectives. After a final design is agreed upon, graphics get printed in panels on a special, car-friendly type of adhesive vinyl. This vinyl is treated with a durable laminate layer to protect its integrity as well as the quality and coloration of the graphics from UV rays, dirt and debris. The car gets prepared for the vinyl. A thorough car wash is required beforehand, plus a final chemical-based rinse afterward to remove any remaining wax, oil, grease or dirt from its surface. These things directly impede the vinyl from properly sticking. Once cleaned, panels are attached to the car one at a time. Panels are pre-marked and arranged for easy installation, fitted and pressed following a set design proof. 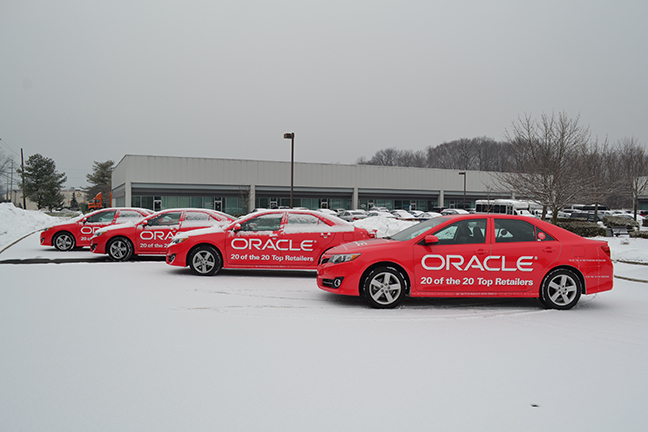 A final installation inspection is completed, and your fleet-wrapped cars are ready to hit the road. Printing and laminating the initial vinyl sheet takes around three to four days, depending on size, colors, the ink used and detailing. Installing the wrap on the entire business fleet takes another few business days for service cars or vans. Outfitting a whole fleet of trucks understandably ups that timeline. CAN I FLEET WRAP MY VEHICLES MYSELF? Generally, you should not try fleet wrapping your commercial vehicles by yourself. This is especially true if you use vans or trucks for business operations. Leave it to the professionals — many of whom are trained and certified in proper fleet vehicle wraps. Specialty Tools: Installing wraps takes particular scissors, scalpels and adhesion tools the average person doesn’t likely have sitting in their tool shed. Exacting Precision: A properly installed vehicle or fleet wrap hugs a car air-tight. There are minimum bubbles or wrinkles across its exterior. Patience: You can’t rush a professional fleet wrap. The quickest turnaround for a single vehicle will mean a full day’s wrapping. Professional Training: What may seem as simple as putting stickers on a car is actually a deceptively detailed process that takes hours of labor — and more than one pair of hands. Multi-Staged: Aside from wrapping the body of your car, individual installation steps occur for windows, roofs and vehicle curves. Applying wrap to windows alone requires handling graphics on a perforated window film more delicate than the regular graphics vinyl. A wrapping studio should aid in the successful installation of your fleet wraps and graphics as much as you require. Communicate both your design and installation expectations early on to ensure you’re getting your needs met. CAN FLEET WRAP HARM CAR PAINT? The short answer? Custom fleet wraps should not damage the factory paint of your vehicle. Previously painted or airbrushed vehicles may experience peeling when the wrap is removed. The average fleet wrap lasts between three to five years, though sometimes longer. Bodywork with scratches or dents not caught during inspections can also cause peeling, as well as weaker vinyl adhesion during and after installation. Freshly-painted cars should wait a minimum of two to three weeks before being wrapped. Pre-test your paint before beginning the wrapping process. This guarantees your commercial vehicles have a proper-conditioned surface and original factory paint. If anything, fleet vehicle wraps should actually help protect the surfaces of one of your most precious business assets. That’s because its protective laminate and glossy or matte-spray finishes give your vehicle an extra layer of defense. As long as your cars have factory-quality paint and the graphics vinyl is removed during its warranty, your vehicles should be safe. Black cars, trucks and vans best hide the gaps between installed vinyl and small but inevitable unwrapped car areas. These include places like the gas cap filler and vehicle door seams. The amount of vehicle left unwrapped likely depends on if you want a full or partial covering. Partial wraps typically get applied on vehicle doors, rears and sides but not on hoods, roofs or the car’s front-quarter panels. A full wrap covers all these areas. As a general rule of thumb, the darker the car color, the easier it is for vehicle wraps to blend or hide seams. ARE FLEET WRAPS EASILY REMOVED OR REUSABLE? Yet another benefit to fleet wraps? 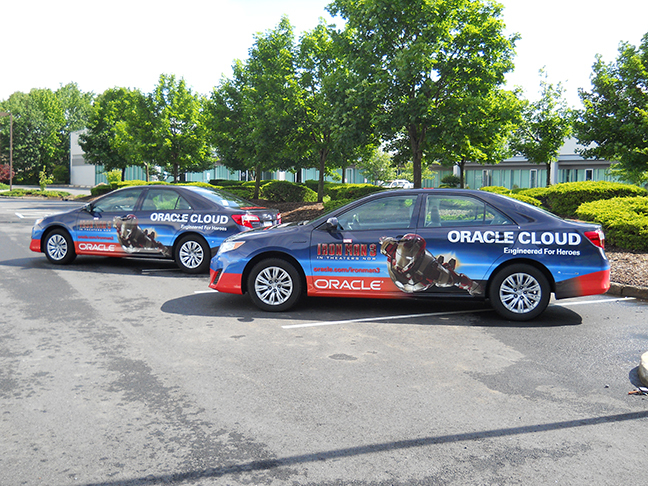 As your business grows and develops, so too can the graphics displayed on its cars. That’s because fleet wraps are inherently customizable. Across their warranty, you can easily switch or swap panels as well as make vinyl alterations using graphic overlays, which are small labels added on top of the existing panels. Company Information Changes: If your phone number, website domain, address or other pertinent business information changes, you don’t have to worry about completely re-doing your entire line of vehicles. Logo Tweaks: Rebranding efforts are made smoother when you overlay new logos atop outdated ones. Minor Panel Damage: Though rare, small scratches or discoloration on pieces of the vinyl — or a whole patch — don’t have to compromise the entire look of your fleet wraps. Fleet-wrap removal is included in most warranties. 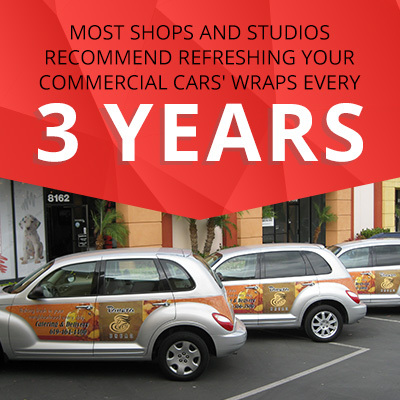 Most shops and studios recommend refreshing your commercial cars’ wraps every three years. This ensures no damage to the underlying paint or factory clearcoat, plus lowers the chance that large amounts of residue will build up beneath the vinyl’s surface. Removing fleet wraps is also relatively quick — usually a day per vehicle. This ensures your fleet of cars won’t sit out of commission for too long. You can get back on the road — and back converting drivers into customers — in no time. HOW CAN YOU CLEAN FLEET WRAPS IF THEY GET DIRTY? Handwash your car whenever possible to remove dirt and grime. Avoid using chemical solvents, corrosives or harsh washing equipment. A little soap and water go a long way. If you must get an automated car wash, opt for the gentlest cycle possible. Never put your wraps under pressure washers. Wait a week or two after your vehicles have been wrapped to do any rinsing or washing. Maintain a regular washing schedule. Dirt, grime and dust that’s allowed to build up will not only affect the integrity of the vinyl’s graphics, but it also makes your professional car look bad. Keep your vehicles out of direct sunlight when not in use. This prevents graphics from fading prematurely and keeps the overall condition of the wrap pristine. Hoses and water streams are okay to use on vinyl. Just make sure you aren’t blasting your bodywork with a liquid jet stream. Use a nozzle with a 40-degree or wider angled spray. Stand at least a foot away from the car as you spray, using warm or room temperature water, never hot. Brushless automatic car washes are okay if you must have a mechanical car wash. Try not to do these too frequently, though. Avoid abrasive washing tools or rough scrubbers. These will only scratch the vinyl. For particularly tricky stains and spot treatments, explore our list of fleet-wrap safe cleaning treatments under “Difficult Contaminants” in our How Do I Care for a Wrap FAQ tab. This includes specific products that have been tested and are safer to use to get rid of bird droppings, tree sap and more water-resistant stains. High-quality wax and polishes are safe on most vinyl films and their laminates. Opt for gentler formulas, never abrasive ones. Do not wax or polish matte-finished or textured laminate vinyl, however. Avoid ice scrapers on window graphics. Use your window defrosters on a high setting and gentle, sweeping motions from hand-held soft brushes to get rid of snow or ice on your windows. Avoid rear window wipers on your window graphics as much as possible. Otherwise, the swiping streaks will begin to show on the pictures or text. Try to avoid rolling down car windows outfitted graphics. Just as with the rear window wipers, rolling the windows down will scratch the graphics. If graphics appear to be browning or discoloring, keep vehicles stored indoors or under a sheet cover. The car may be growing discolored due to acidity in rain or morning dew, especially if you live in an urban area. Professional graphics for your business means more than standing out from the crowd. It’s about conveying an experience — one that propels your brand identity and makes people want to engage with you, time and time again. With a range of quality, custom car wraps for your complete fleet of commercial vehicles, you can stand out from the crowd for all the right reasons.